With the help of Ty Pennington, the folks at Sears Home Services successfully launched the “Building Community Together” project. Let’s face it. Giving back to the community is inspiring. Where did this lead us? To develop the “Building Community Together” initiative to improve homes and other buildings in the communities where our technicians and customers live. ​If you need repair or maintenance for your home appliances, the experts at Sears Home Services can help. To bring the project to light, Sears Home Services joined forces with the nonprofit Rebuilding Together. Our team had the help of a very special friend: Extreme Makeover Home Edition’s Ty Pennington. We couldn’t ask for a better partner. The team started out by identifying communities in need of assistance, focusing on issues such as critical home repairs, accessibility and energy efficiency. 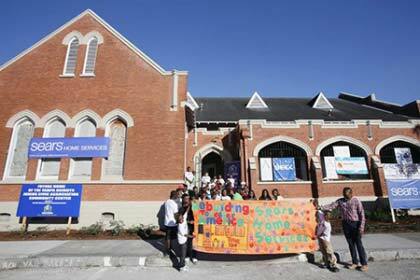 First up: the renovation of three homes and the conversion of a church into a youth community center in Tampa, Florida. The Tampa Heights Community Center was in desperate need of a new location that could accommodate more of the neighborhood youth. There was only room for 80 kids, when there was a demand for much more. In 2009, the Tampa Heights Junior Civic Association had leased an old church but lacked the resources to complete renovations. So, on February 11, Pennington, Rebuilding Together, locals and nearly 80 volunteers from Sears Home Services donated their time, materials and talent to renovating the church into a new community center. The team also replaced siding, roofing and windows, as well as upgraded the kitchen and bathrooms for three local homes. In just one day, the team made impressive headway toward completing the community center, set to open this summer. When it does, it will be a safe haven for 200 youth to learn computer skills, healthy eating habits and more. The project couldn’t have come to fruition without the help of donations from Sears Home Services and other corporate partners, including Sears Retail and Craftsman Tools. After achieving so much, the Sears Home Services team is ready to help other communities in need. Stay tuned to learn about our projects in Sacramento, Chicago and Philadelphia. Learn more about Rebuilding Together Tampa.